If the tunes in Crazy for You, the “new” Gershwin musical first staged in 1992, sound familiar, it’s because you’ve heard them before. Gershwin classics like “Embraceable You” and “I Got Rhythm” debuted in 1930 in the musical Girl Crazy, and “They Can’t Take That Away From Me” was performed by Fred Astaire in the 1937 film Shall We Dance. If the audience reaction at The Wick’s production of Crazy for You is any indication, these and other earworms that were resurrected to produce the Broadway hit are as captivating today as they were decades ago. The story starts in New York City, where banking heir Bobby Child (Matt Loehr) tries unsuccessfully to realize his stage ambitions. His rich mother (Dalia Aleman) has a different plan, so she sends him off to a mining town in the Nevada desert to foreclose on an ailing theater. The local townsfolk resent Bobby at first sight, but “Things are Looking Up” when feisty Polly Baker (Julie Kleiner) walks into his life. To win her affection, Bobby decides to put on a show to save the theater. When she’s unimpressed, he fakes street cred by impersonating Zangler Follies producer Bela Zangler. Surprise—Polly falls for “Bela,” but then the real Bela (Wayne LeGette) comes to town and all manner of chaos ensues. The number performed by the two Belas, “What Causes That?,” is one of the show’s most hilarious moments. Other highlights are Bobby (as Bela) and Polly’s rendition of “Embraceable You,” the cowboys’ kitschy (but very funny) performance of “Slap That Bass,” and all the tap-dancing in between. In the end, Bobby gets the girl with a little help from the townsfolk, and everyone rides off into the sunset. It’s a fun, happy show with singing and dancing that is so entertaining, so high-energy that it will stay with you for days. 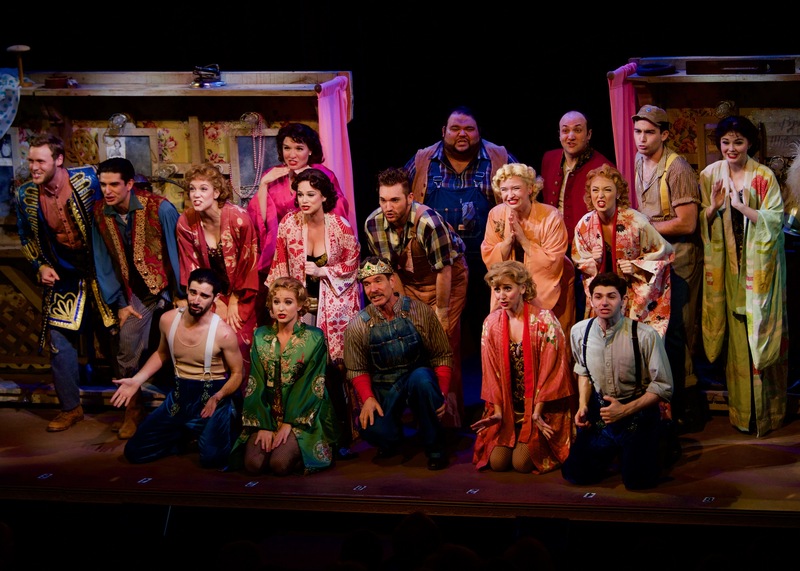 Crazy for You plays at The Wick until April 14.